This bag is made of 1680D polyester construction and tarpaulin fabric backing - Provides strength and durability against wear and tear. I has 3 all-terrain wheels - Enhances mobility and stability anywhere, and a full-length zipper opening to facilitate packing and unpacking. This bag also has multiple reinforced exterior grab handles to facilitate transportation. Ventilation grommets at sides - Allows air flow-through to promote freshness. 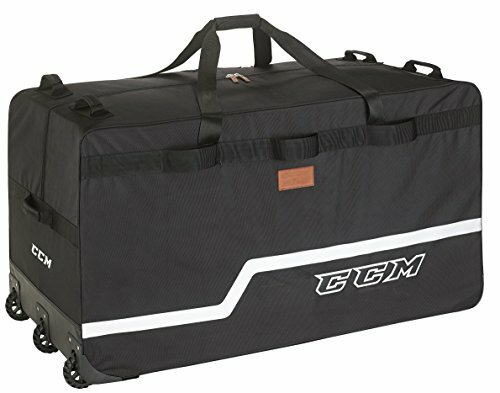 Extras include side interior pocket, separate skate mat, laundry and mask bags. The size of this bag is 44" x 24" x 24"